When people first meet in a professional context, it is customary to exchange business cards to introduce each other. A business card details a person’s name and position and enables both parties to formalise their first introduction. In the Chinese culture, a business card exchange makes a great first impression to another party and should not be treated too casually. When done correctly, a simple act of exchanging business cards can take the introduction to the next level; whereas when done incorrectly, it will make a bad impression on the person and the organisation they represent. Here we will describe the Chinese business card exchange custom and what you should say in different scenarios. Who Should Present Their Business Card First? The usual practice is that for guests to present their cards to the host first, or for the person of a lower ranking to present their card to the person of a higher ranking first. When there are many people to exchange cards with at the same time, it is alright to do the exchange with the person closest to you instead of following the general practice of having a more junior person presenting their card to a more senior person. When presenting the card, hold the card with both hands using your thumbs and index fingers. The card must be facing the recipient and the letters on the card must be readable from the recipient’s angle. Maintaining an eye contact with the recipient, the one giving out their card should say ““这是我的名片，请多多关照。Zhè shì wǒ de míngpiàn, qǐng duōduō guānzhào.” The literal translation of this phrase is: “This is my name card, please take good care of me”. The card must be given out after each party has been introduced. 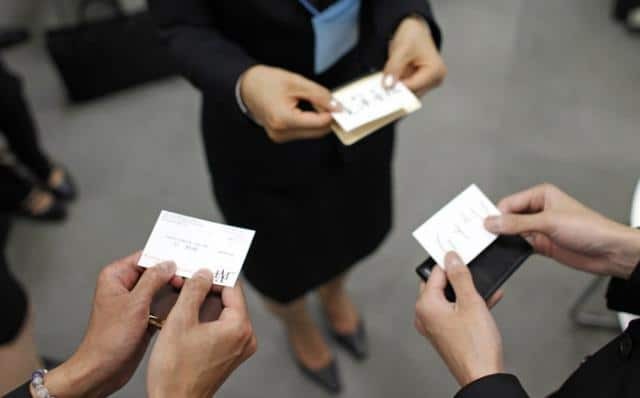 When people from different cultures meet and exchange their business cards, depending on where the gathering is held or who the host is, it is acceptable to not follow the above customary practice and follows a more casual approach to delivering one’s business card instead, such as by using one hand when giving out the card. Just like the proverb “When in Rome, do as the Romans do” or the Chinese equivalent of this proverb is “入乡随俗 rù xiāng suí sú”. When accepting a business card, the recipient should get up if seated, or bow a little. Use both thumbs and index fingers to hold the two corners of the bottom of the card. The recipient should then say “谢谢! 能得到您的名片十分荣幸！Xièxiè! Néng dé dào nín de míngpiàn shífēn róngxìng.” (Thank you! It is an honour to be receiving your name card!) If receiving a name card from someone who has a high status or a certain popularity, you can say “久仰大名 Jiǔyǎng dàmíng” which means you have heard of that person and conveys your admiration of the other party. The recipient should spend some time to study the card carefully before putting the card in a card holder. One should never place the card in a pocket or a handbag as this is considered rude. One party will take the initiative to present their business card and the other party will normally follow suit and give out theirs as well. One party will take the initiative to present their business card, saying “这是我的名片，请多多关照。Zhè shì wǒ de míngpiàn, qǐng duōduō guānzhào.” followed by ”能否有幸与您交换一张名片？Néngfǒu yǒuxìng yǔ nín jiāohuàn yìzhāng míngpiàn?” (May I have the honour of exchanging business cards with you?) to specifically request for the other party to exchange their business card with you. When exchanging business cards with someone of equal ranking (based on age and ranking), you can say “不知以后如何与你联系？Bùzhī yǐhòu rúhé xiàng ní liánxì?” (May I know how to keep in touch with you?) Note that the speaker will use “你 ní” instead of “您 nín” in this case. Want to learn Chinese for business? Click below!